Cars spotted, garage pics, driveway pics, misc pics of random car work. Thread: Cars spotted, garage pics, driveway pics, misc pics of random car work. Facebook album permalink (in case the images don't show up in the future). If I don't post pics I've taken and hosted on Facebook that are car related then I feel empty inside. 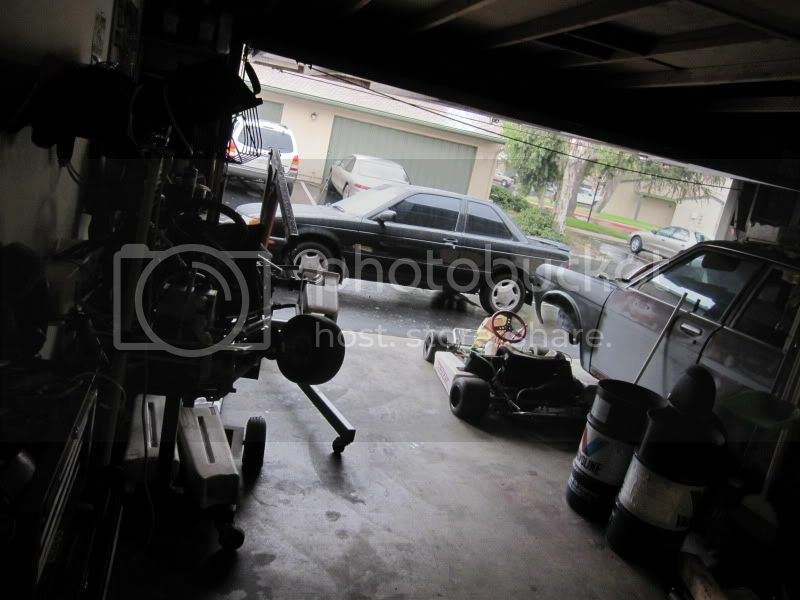 This was the state of the garage while I freshened up the transmission and the new (to me) engine. One time only hook up of $1/quart oil by our man @bhowle. bhowle in his old P10. There were a lot of cars in the driveway this day. How many can you recognize? The beast meets its end. Headed to the metal recyclers. My brother's SE-R had a huge hole in the flex pipe so I gave him my old one for real cheap. I didn't think it would work, but the nuts came right off with some heat. His cat hanger crumpled to rusted pieces when I took it off. Luckily I had a new one I bought from Greg a long time ago laying around. No pics of the new lead pipe but it was only a couple years old and in great condition. Edit from 2013: Fun fact, @klassickrican owns this chassis now. The thing seems to be glued shut. No one can open it with their bare hands. The challenge to open it is given to anyone who comes over the house. It took maybe 6 months but finally a visitor from New Zealand (Fred) opened it (with his teeth! ). Last edited by BenFenner on 2014-07-07 at 21-49-26. It can be messy and you will still know where everything is. I would love to keep my garage cleaner, but just don't have the time for it or motivation hehe. sr20sean, PM forum member danmartin about the parts you're looking for off the 240. He'll know what he has and what he'll sell them for. For those 10 seconds it takes to reach 60mph, i can safely text and go WOT. Garage looks the norm for anyone who knows what they are doing. It gets a "f" because i see no Taco bell wrappers or Burger king fry boxes.... everyone knows real wrenching has fast food involved!!! I don't get it... what's the deal with Dan's S13? B15 SE-R Spec V i/h/e/bsr/es mmi's/es bk/ss/ltb/coilovers SOLD..!